Preheat oven to 450°.Prepare the shrimp according to package directions. Combine Alfredo sauce and marinara. Spread over pizza crust. Sprinkle cooked bacon crumbles and half of the mozzarella over pizza crust. 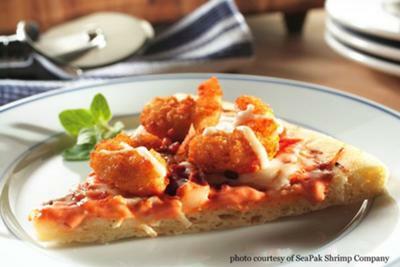 Scatter cooked shrimp over pizza and top with remaining cheese. Bake pizza for 10 - 15 minutes or until cheese is melted. Slice and serve immediately.